Bradford forms part of the West Yorkshire Urban Area conurbation which, in 2001, had a population of 1.5 million and is the fourth largest urban area in the United Kingdom. The name of the city is actually a derivative from the old english and it was recorded as "Bradeford" in 1086. During the Industrial Revolution, Bradford has become a very rich city, a world center for the production of textiles, especially wool fabric called 'worsted. In 1847, Bradford became a borough, that is to say, city mayor and corporation. In 1897, she got the city status, with a Lord Mayor. The world's first UNESCO City of Film, Bradford is a thriving cultural destination with a packed events calendar, award-winning museums, galleries and impressive theatres. Bradford is quite a good place for couples because of a place called Bradford "century of love" where most Bradfordois come for a picnic. - K2 Nightclub : here cocktails are served all the night long and the music go on until the morning. - Revolution : a place to be I you are in fond of cocktails ! - Then you can find some goods restaurants to have a quiet evening. The National Media Museum ( the National Museum of Photography, Film and Television) is part of the national Science Museum Group. This museum focuses on photography, television, animation, videogaming and internet. The Bradford Industrial Museum specializes in relics of local industry, especially printing and textile machinery, kept in working condition for regular demonstrations to the public. 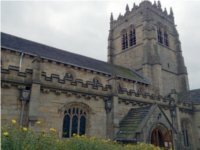 The Bradford Cathedral, its full name is Cathedral Church of St Peter, is located in the heart of Bradford on a site used for Christian worship since the 8th century when missionaries evangelised the region. Another thing you shall have to visit in Bradford is the Odsal Stadium. The stadium is used primarily as the home of Bradford Bulls Rugby League team with current capacity of 26,019. The Kirkgate Shopping Centre is the main shopping retail facility in Bradford city centre. It includes Primark, New Look, River Island, Bank, W H Smith, Boots, Deichmann and F. Hinds in its 65 shops, as well as an indoor market and 550 car parking spaces. You can also go in the downtown and have a look on the little shops to find some souvenirs of your trip in Braford. Bradford also got some of the best Asian shops in the country. Bradford's markets offer you great local produce, crafts and gifts. Bradford benefits of a maritime climate, as all the United Kingdom. It has got limited seasonal temperature ranges, and generally moderate rainfall throughout the year. The hottest months are during the summer in July and August with a record of 32.2 celsius degrees (90 farenheit degrees). And the coldest month is January with a record of -13.9 celsius degrees (7 farenheit degrees). Standard time zone: UTC/GMT +0 hour. You can find in the city a lot of buses line, some are free and other not but you can buy special prices so less expensive. Then you can get around the city with the train. More than 12 lines are available for you to move all around the city. Leeds Bradford International Airport is 6 miles (9.7 km) to the north east of the city.